Sekhmet is a unique being - one of a kind, she says. She is the standing lioness who was revered in ancient Egypt as the patroness of physicians and healers. She was in charge of the healing temples and taught the priests and priestesses powerful and ancient healing techniques and modalities. Because of her knowledge of what were, even then, ancient wisdoms and their effectiveness, she was known as "the powerful one," a name by which she is recorded in the Egyptian records. She has been in many societies and different civilizations on this planet and others where she has not been recognized because she was working behind the scenes and thus is not in the history books. She is a traveler who enjoys bringing through ancient healing methods because they are in resonance with the entire planet rather than just a mixture of chemicals in a pill. Sekhmet has freely given to truly heart-centered healers and was not concerned about getting credit. Some disgruntled healers in ancient Egypt who just wanted to be great but didn't have the level of heart to do so, have portrayed Sekhmet as a bloodthirsty and vengeful warrior. She fully acknowledges the incident that they emphasize, where she got carried away in ending the lives of humans who apparently needed a lesson, for which she felt remorse and forgave herself and was forgiven. What Sekhmet wants us to know about that is that even in the higher vibrations, Spirit beings can feel feelings at the moment something occurs to bring them up. What they want us to know is that it's OK when these feelings come up. They are here to let us know we are forgiven, to clear these feelings and help with the healing. 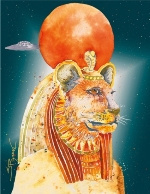 All of this knowledge from ancient times is very relevant now as Sekhmet is with us to help us bridge to ascension by bringing forth the high frequency ancient wisdoms, by supervising and overseeing the transitions and bridging modalities in the healing arts, and by learning what really does the complete and total healing job. Sekhmet is a great teacher. She loves to lecture and teach the ancient methods, the connection with the body, the mind, the emotional self, the Spirit and the past. The cornerstone of her teachings is the need to clear out the past. She will teach a lot more about this at the Ascension Center on Maui, emphasizing that you can't take it with you, and more about what those bags of gold mean to you, asking such questions as, what kind of energy do they carry and what have you done to acquire them? Sekhmet will also be speaking about ORMEs (orbitally rearranged monoatomic elements), as she says, the only real and relevant identity for gold and other precious metals and the real value of them. Sekhmet is very passionate and of course, she roars, and thus was an intimidating presence in ancient Egypt to those who did not understand. Yet, she is all heart. She has compassion, respect, reverence, and appreciation for that which the lightworkers are bringing forth and have the courage to practice. Sekhmet has much advice to offer and is anxious to begin workshops and gatherings at the Ascension Center to do that. She will continue to present healing modalities, technologies and compassionate support to those who choose to go to parallel planet Earth which is not going to ascend as well as to those who do. As she says, "To dance or not to dance, that is the only question." Sekhmet says she is absolutely the daughter of Ra because she has been here from the beginning* and has been to other places and beyond. She is here now to create energies of Joy and upliftment and to teach a very old and honored healing technique called Joy, because Joy is about to burst forth everywhere for those who welcome the big changes. She says that it is an empowerment and energizer to the Ascension process and that one has to let go of depression and let Joy in to accomplish Ascension. Sekhmet wants her ongoing legacy to be Joy, Big Joy! * Sekhmet says that while she and Hathor both have great connections with the ancient Egyptians and with the ancient, ancient civilization of Venus, they are separate and distinct personas. She says they are one in the sense of Oneness and close in the sense of Family but not the same identity. Given through Susan Leland and edited by Fran Pearre, September 12, 2010. www.AshtarontheRoad.com © Ashtar on the Road Publications 2010. All rights reserved.